Netflix appears on the verge of creating a new, higher priced tier of service. At the same time, there could be some changes made to current plans that are bound to anger many Netflix subscribers. According to a report out of Italy, Netflix will add a new fourth tier of service called Ultra that will be priced at €16.99 a month in Italy. Based on current pricing, Netflix would charge $16.99 in the U.S. The only difference with the Ultra plan is that it supports HDR video and HD audio, and four screens can use the subscription at the same time. Some Italian consumers say that based on promotional material they've received from the video streamer, the new Netflix lineup reduces the number of screens that can stream Netflix simultaneously with the Premium plan from 4 to 2 (see image at the top of this article). 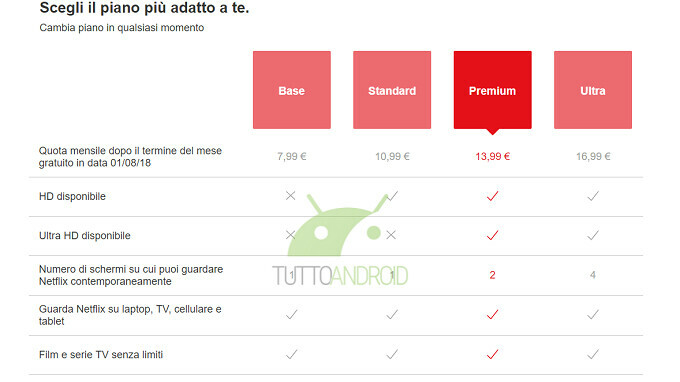 However, others in Italy who received information about the new Ultra tier say that the Premium service will continue to allow four screens to stream Netflix at the same time. If Netflix does cut the number of simultaneous screens in half for its Premium plan, that would be akin to a price hike for those who share the service with three other users. Keep in mind that Netflix has yet to officially change its current plans yet, so you might want to wait to see what the streamer does before you start looking at other apps as a replacement. Netflix's current pricing schedule in the U.S.
Come on Netflix. This is too many consecutive price increases. If you want to add more expensive options, do it by adding more premium features. Don't just keep moving the goalpost. Outside of your original content, Amazon Prime is better for movies now, anyway.